A German lorry driver has been arrested in Bamber Bridge on suspicion of smuggling illegal immigrants into the country. The 51-year-old was arrested on Wednesday (February 20) after two Iraqi nationals were discovered hiding in cargo inside the wagon's trailer. Two Iraqis, suspected of being illegal immigrants, were found inside the trailer of a lorry in Old Lostock Lane, Bamber Bridge on Wednesday, February 20. Police stopped the lorry in Old Lostock Lane at around 8.15pm after members of the public spotted the driver helping people out of the back of his wagon. Officers conducted a search of the vehicle and discovered a man and child stowed away among the cargo. Police reported the incident to the Home Office and a squad of immigration officers were dispatched to the scene to assist. Lancashire Police confirmed that the driver has been arrested and charged on suspicion of assisting illegal entry to UK. The two Iraqi nationals, believed to be father and son, were detained on suspicion of illegal entry to the UK. After being transferred to UK Visas and Immigration for further enquiries, the young male was handed over to social services. 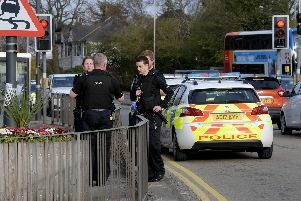 A Home Office spokesman said: "Home Office immigration officers were contacted by Lancashire Police on Wednesday, 20 February, after police officers attended an incident on Old Lostock Lane, Bamber Bridge, Preston. "A 51-year-old German man was arrested and charged in connection with assisting unlawful immigration. "A man and a minor, presenting themselves as Iraqi nationals, were referred to the Home Office. The minor has been passed into the care of social services. "All cases will be progressed in line with the UK immigration rules." Lancashire Police added: "The ongoing investigation is being led by Immigration Enforcement Criminal and Financial Investigation officers. The German lorry driver has been remanded in custody to appear at Preston Crown Court on Tuesday, March 26.